Join us at Innovative Martial Arts Academy today and treat your child to the most exciting martial arts training in Wake Forest. Our Kids Martial Arts program offers age-specific classes in multiple disciplines, giving your child the best chance to thrive from day one. We take pride in helping students all across Wake Forest, Wakefield, and beyond build a foundation of discipline, respect, and self-confidence. Get your child started today. Just fill out the short form on your screen to learn more! At Innovative Martial Arts Academy, there is no experience level required. No prior skills are needed to enjoy our classes! 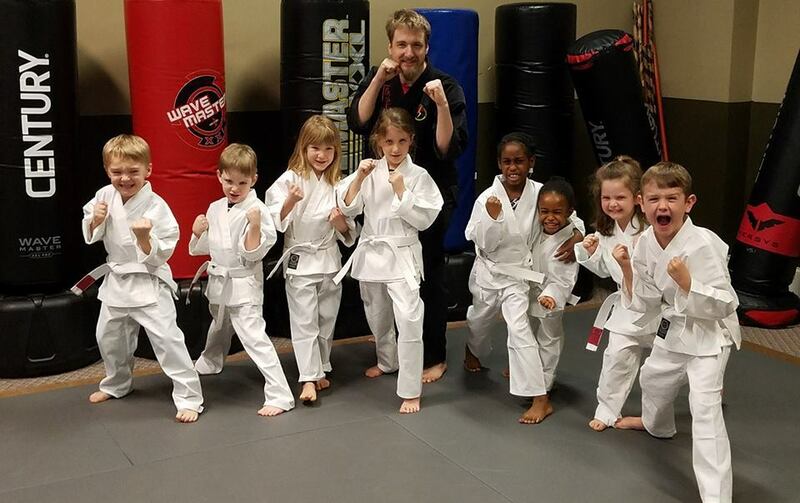 When your child joins our Kids Martial Arts program, they'll enjoy hands-on instruction and a system of age-specific offerings that surround each student with classmates of their same skill level and ability. Lil' Ninjas (Ages 3-5): Our most basic instruction, this program introduces your little one to the foundations of movement and coordination. We have a blast teaching kids how to listen and follow directions. Every class is held under close supervision. Young Dragons (Ages 5-7): High-energy training for students of all abilities. Young Dragons take on the basics of traditional martial arts disciplines and challenge students every day with basic movements and exciting drills. Kenpo Beginners (Ages 8-12): Introduce your child to the art of Kenpo Karate - an American martial art that focuses on speed and efficiency. This class is the best way for beginners to get a feel for our classes and work their way through our ranks. Advanced Kenpo (Ages 8-12): If your child has a feel for the martial arts and a few years of experience under their belt, our Advanced Kenpo program is perfect. We push students to be stronger and more accurate in their striking and self-defense techniques. Students ages 13 and older are invited to participate in our Adult Martial Arts program. Check it out today! Every child who comes through our doors looks forward to the exciting punches and kicks and challenges of martial arts training. But our team is proud to offer so much more. Our Kids Martial Arts program pushes students to build mental and social skills alongside the physical tools our classes offer. We do that by surrounding students with positive role models and building them up through a series of accomplishments. Whether your child goes on to be a professional Black Belt or a professional in some other field, they'll learn quickly to rely on the foundation we built at Innovative Martial Arts Academy in everything they do. Take The First Step Today With Our Kids Martial Arts Classes In Wake Forest! Don't miss out on the most exciting Kids Martial Arts training in town. We are proud to work with students of all backgrounds and abilities, helping everyone in our community learn self-defense and self-respect in no time. Just fill out the short form on your screen to learn more about Innovative Martial Arts Academy and everything else we have to offer in Wake Forest.